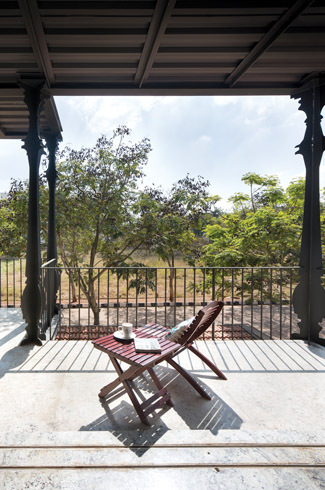 The Corbel House in Bengaluru is a calm expanse dominated by the terracotta hues of exposed brick walls and the nostalgia of traditional architectural sensibilities of Kerala. Sometimes, the quietest homes make the greatest statements. 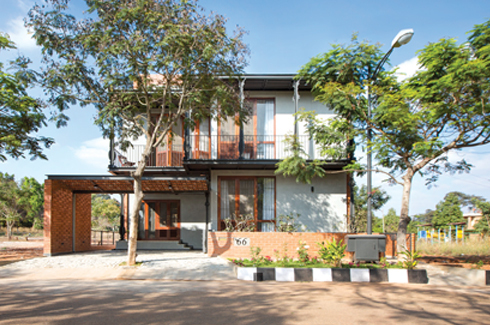 The Corbel House, realised by city-based Kamat&Rozario Architecture, sits on a 3,650 sq ft area in Bengaluru, but evokes the fondest of feelings of being in Kerala. 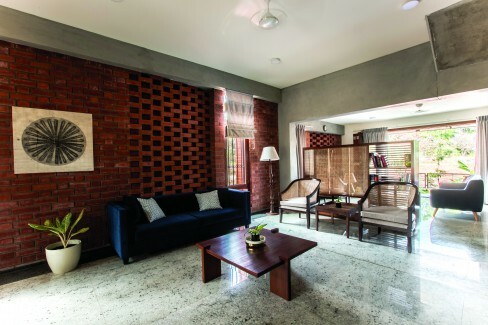 Decidedly taller and more modern in form if we were to compare, this home pays tribute to Malayali design sensibilities through a nostalgic array of elements – the terracotta ambience of the exposed brick is plentiful, there is a good presence of cane mesh furniture, and an overhanging balcony is held up by carved columns. 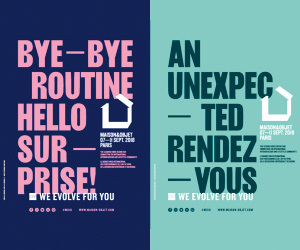 It is to the design team’s credit that it hasn’t just picked the right materials but also given them enough space to assert their authority. There are no sudden flourishes here; instead there are near-contiguous swathes of material that create a comforting familiarity, so essential in a home. Air has a free run of the spaces inside the Corbel House. A central skylight lets a draft in from the top, while the windows and doors are many and wide. The latter can be shut-off or opened using everything from screen doors to retractable doors to blinds and curtains, allowing for a wide gradation of sunlight and ventilation to pass through. Views from the home were important, which is why the front façade takes in the benefits of a quiet street while the back opens out to a park. 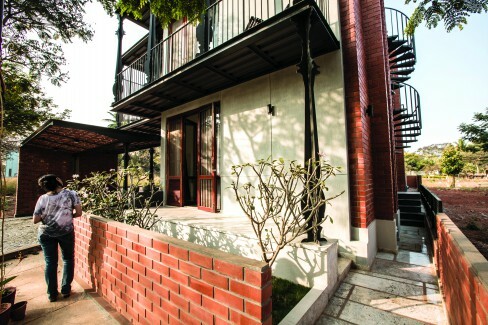 There is so much beauty that awaits a visitor inside, but the exposed brick masonry of the façade dominates the senses. 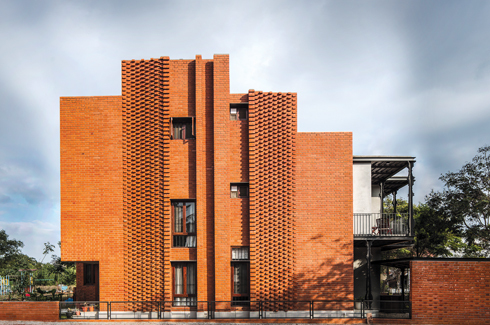 The plain brick surfaces here are broken by stout patches of corbel work, imbuing the walls with a curious mix of past-century coarseness and a slicker modern feel. 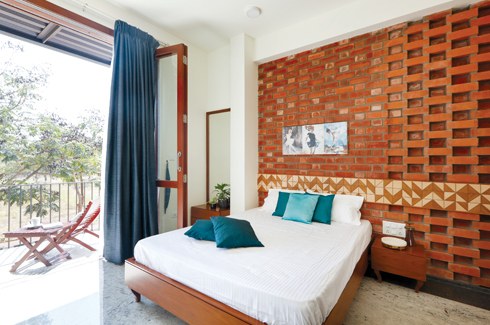 Traditional Keralite architecture loves its layout of earthen tiles, the one that splits the sunlight to create carpets of bright spots across the spaces. 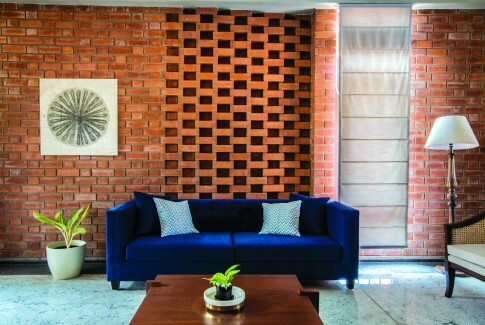 The corbelled wall here, created using Flemish bond, replicates that sensory experience. Juxtaposed with the metal railings visible outside and the lovely polished wood furniture inside, all the brick surfacing comes to look more solidly striking. In its company, the metal is allowed to look dainty! On the inside, a sense of expansiveness is established by the seemingly seamless white and lightly-speckled granite flooring. There is remarkable unity of aesthetics inside this home. 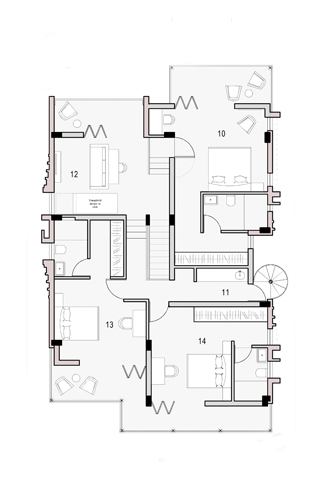 The spaces are fluid not exactly literally, but because of the presence of the same elements throughout, albeit with some minor alterations when necessary. 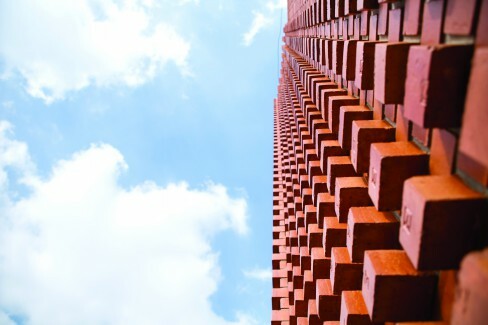 So, a slim horizontal patch of geometric patterns may pop up at a bed’s headstand, but it is still that same plain-and-corbelled brick wall giving you company. The wooden furniture is exquisitely simple –sharp angular forms are relied upon while the legs and stands are done away with; now they are wall-mounted and free. There is deep delight in admiring the louvered, deep brown and smooth sheen of these fixtures. 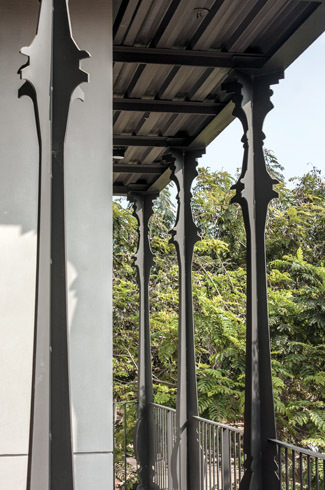 The metal sheet columns, especially created to pay homage to Kerala’s affinity with them, are clearly doing some heavy-lifting while at the same time looking delicate, like they were made out craft paper. 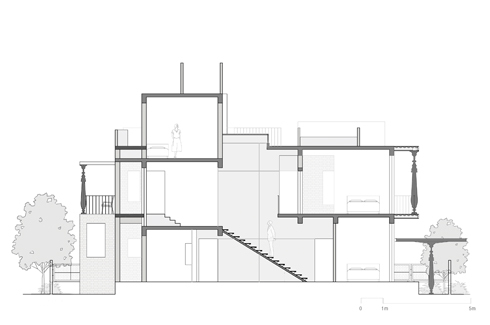 “These columns frame the front of the house and sit on a large continuous overhanging balcony. The overhang in the front not only protects the south façade but also allows for ample cross ventilation,” the team clarifies. All the public areas and the guest room are located on the ground floor, while the owners’ and the children’s bedrooms are upstairs, as is the family room. Right on the roof, a solar panel set-up has been laid out. The ample cross-ventilation and natural light influx gives the home solid environment-friendly credentials. Another facet that would make traditional Kerala homes consider the Corbel House a member of the same family!